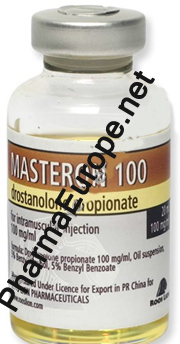 Masterone information Masteron(Masterolon 100) - dromostanolonum propionate 2000 mg Vials 20ml 10 mg/ml is a steroid highly valued as a part of a pre contest bodybuilders stack. Masteron(Masteron 100) doesn't aromatize - it can't be converted to estrogen. Drostanolonum is highly androgenic and a strong anti estrogen with minimal liver toxicity, it is usually used as a part of cutting stacks for the last few weeks of contest preparation, Masteron(Masteron 100) works best in stack with Primobolan, Anavar, Winstrol and Testosterone propinate (Testovis). Masterone dosage The athlete can therefore use Masteron(Masteron 100) to about ten days before a drug test. The average dosage is 100 mg injected every other day. It is best to inject it every 2-3 days because it has a short duration of effect. Masterone cycle and side effects Popular steroids stacked with Masteron(Masteron 100) (drostanolone propionate) include Parabolan (trenbolone hexahydrobencylcarbonate), Winstrol (stanozolol), and Anavar (oxandrolone). Athletes rarely experience any side effects. It is not hepatoxic, and gynecomastia should not be a concern since it does not convert into estrogen. Some possible side effects of Masteron(Masteron 100) include acne, accelerated hair loss, and increased aggression. The main disadvantage is a very poor availability on the black market and its high price. Masteron is a European injectable preparation containing the steroid drostanolone propionate. Drostanolone is a derivative of dihydrotestosterone, most specifically 2alpha-methyldihydrotestosterone. As a result, the structure of this steroid is that of a moderate anabolic/potent androgen which does not aromatize to estrogen. Water retention and gynecomastia are therefore not a concern with this compound; as of course here estrogen is usually the culprit. Masteron may in fact exhibit antiestrogenic activity in the body, competing with other substrates for binding to aromatase. This would reduce the conversion rate of other steroids, Masteron acting in the same manner as the oral steroid Proviron®. Bodybuilders have a strong appreciation for non-aromatizing androgens, and find Masteron very useful as a cutting agent. It is likewise generally used a number of weeks prior to a competition, in an effort to bring out an improved look of density and hardness to the muscles. For this purpose Masteron should work exceptionally well so long as the body fat percentage is low enough. Provided everything fits as if should, the user can achieve that "ripped" look so popular to professional bodybuilding. The androgenic effect can also be crucial during this period, a time when caloric intake is drastically lowered. The user is provided added "kick" or "drive" to push through the grueling training sessions leading up to the show. Drostanoione was once also popular with athletes subject to drug testing, as for a period of time this compound was not screened for during competition. The urinary metabolites of drostanoione were recognized by the early 90's however, and this drug now adjoins a long list of anabolic/androgenic steroids identifiable during urinalysis testing. Although some bodybuilders claim they can safely use Masteron if discontinued three to four weeks before a test, there are always uncertainties with the use of esterified injectable steroids. This perhaps makes the oral DHT Proviron® (1-ethyldihydrotestosterone) a slightly better choice, as orals offer much better control. Recreational users might also be interested in Masteron. Although dihydrotestosterone is not highly active in muscle tissue, the 2 alkylation present on drostanoione considerably intensifies its anabolic effect. It can therefore be used somewhat effectively as bulking agent, providing a consistent gain of high quality muscle mass. It can also be successfully combined with other steroids for an enhanced effect. Mixing drostanoione with an injectable anabolic such as Deca-Durabolin® (nandroione decanoate) or Equipoise® (boldenone undecylenate) can prove quite useful for example, the two providing notably enhanced muscle gain without excessive water retention. For greater mass gains, one can alternately addition a stronger androgen such as Dianabol or an injectable testosterone. The result here can be an extreme muscle gain, with a lower level of water retention & other estrogenic side effects than if these steroids were used alone (usually in higher doses). Masteron could of course be used during cutting phases of training as well. A cycle of this drug combined with Winstrol®, Primobolan® or Cxandrolone should provide great muscle retention and fat loss, during a period which can be very catabolic without steroids. It is an added benefit that none of these steroids aromatize, and therefore there is no additional worry of unwanted water/fat retention. The propionate ester used with this compound will extend its activity for only a few days. With such a short duration of effect, injections need to be repeated at least every 3 or 4 days in order to maintain a consistent level of hormone in the blood. Factoring this in with its low strength (50 mg/ml), men will generally inject a full 2 ml ampule of Masteron (100 mg) every two or three days. The weekly dosage therefore lands in the range of 200-350 mg, a level more than sufficient to receive good results. We also should mention that while some women do profess to using this item before a show, it is much too androgenic in nature to recommend. Virilization symptoms can result quickly with its use, making Masteron a very risky item to experiment with. If attempted, the dosage should be limited to no more than 25 to 50 mg each week. The female athlete would be further served by increasing the number of days between injections to prevent buildup of steroid in the body. In this case, Masteron can perhaps be administered once every 7 days. Since estrogen offers us no trouble, side effects are generally mild with this steroid. As discussed earlier, gynecomastia and water retention go unseen. So are problems controlling blood pressure, again usually associated with estrogen. Masteron is also not liver toxic, so there is little concern stress will be placed on this organ, even during longer cycles. The only prominent side effects stem from the basic androgenic properties of dihydrotestosterone. This includes oily skin, acne, body/facial hair growth, aggression and accelerated hair loss. Since this compound is already a synthetic DHT, Proscar® would have no impact on the level of androgenic effects. Men with a receding hairline (or those with a known familial predisposition for baldness) may therefore wish to stay away from Masteron completely, as the potent androgenic effect of this steroid can easily exacerbate such a condition.